We only have one running store in our town, and while it's a nice one, sometimes their shoe size selection is lacking, which probably comes from being the only store in town - everyone shops there and buys up all of the sizes before we can get to them. 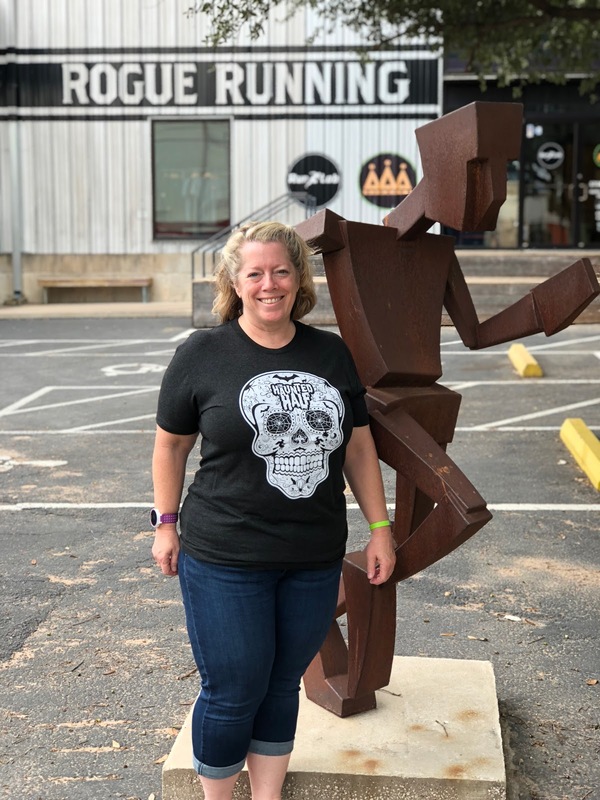 So when Diane and I went to Austin a couple of weeks ago for the Halloween 5K, we also planned on visiting all four running stores in Austin. 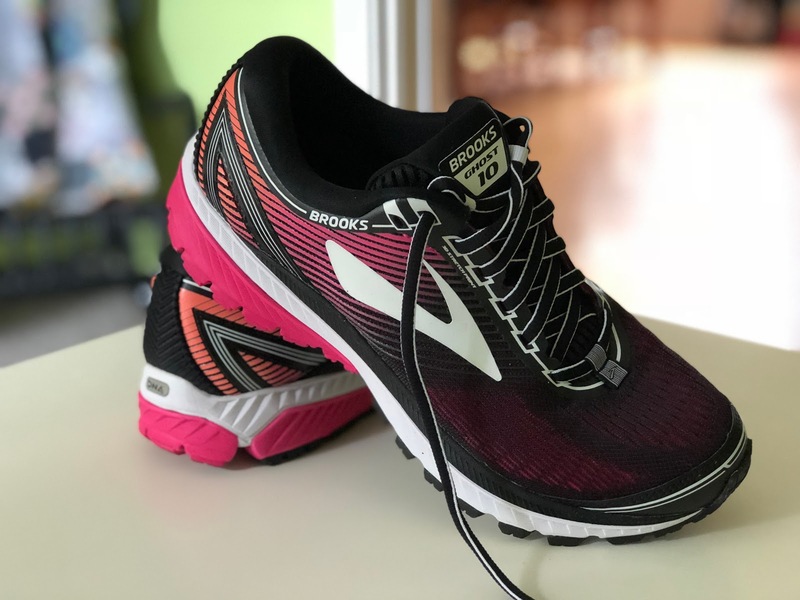 She's been unhappy with the latest version of her shoes, the Hoka Bondi, and I knew that I'd be needing another pair of shoes to add into my rotation as the mileage on one pair was getting close to the top for me. Plus, it's always fun to check out running stores and see what different items each one carries. Why yes, of course we stopped to take a picture with the sculpture, haha. The building was huge but it wasn't all store - there is room for activities such as yoga, plus they have restrooms as well as showers. In chatting with our salesperson, she mentioned that they have huge group training runs from this location every Saturday morning - you can pay to join and get a training program for all kinds of distances and goal races. Good to know if you live in the Austin area. We wandered around, looking at their merchandise - it was interesting to see different brands of clothing, plus they had a lot of accessories. I had my eye on a very cute gear bag, which I totally didn't need because I had finally upgraded my bag about six months ago, so I didn't buy it (pats self on back). Diane did need a new hydration belt system and they had a large selection to choose from; she found one she liked and bought it - it was a Nathan with two 12 ounce bottles, plus a pouch large enough to hold her iPhone 7 along with GU and Chapstick - all the essentials for a long run. I needed a new handheld water bottle for my shorter runs because the one that I've had for over three years is disgusting. I found one I liked but couldn't bring myself to buy it just yet, as it was $35 - shoot, the entire belt system Diane bought was only $50, so the handheld seemed kind of overpriced. Then we moved onto the shoes. Our salesperson was wonderful - Diane explained to her what she's been wearing, what she was unhappy about with the latest version, and our salesperson brought out several pairs in her size, in different brands, to try on. The first thing that struck both Diane and I was that they had shoes in her size, and that they were in pretty colors! She had choices! It was really nice; I've gone shoe shopping with her and so often she's been told that they don't have her size, or that they can order it, or that she could wear a men's size - it's been frustrating to not be able to walk out with a new pair of shoes when you want, so this was a fun experience. The 1080, now with Fresh Foam! But, they were the same price as the Brooks Levitate, so I didn't want to buy these if I found the Levitates and tried them on and loved them. Diane ended up choosing a pair of Brooks Ghost 10 shoes, and with that and her fuel belt purchase, we were finished and off to the next store. 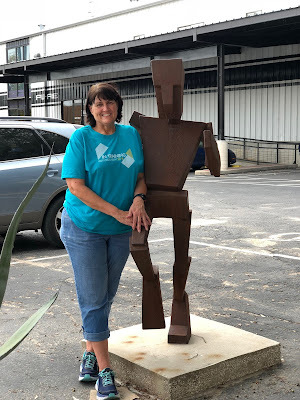 We both really liked Rogue Running - the atmosphere, the selection, the salespeople were all great and we agreed, we'd definitely make a point to return there next time either of us are in Austin. After that, we went to Ready to Run, which we managed to find despite Google maps. This store is located in a nice strip center. It's a locally-owned store and had quite a few cool t-shirts with their logo and RUN in various designs on them; Diane bought one but I didn't, as my size wasn't available in the one I really liked. This stores also has a lot of running groups who meet at and run from their location throughout the week; I love it when running stores become a part of the running community like that. They had a lot of clothing that not only was different from what we saw at Rogue, but also some stuff that I've only seen online, so it was neat to see it in person. I found the same handheld water bottle there, but it still was $35, so again, I didn't buy it. Comfortable, plus pretty colors, woohoo! The next store we went to was Texas Running Company. When we arrived, I realized that I've been there once before, probably five years or so. It's a huge store, located in a big outdoor shopping center that also has an REI, a Nordstrom Rack, a Birkenstock store, and The Container Store. Oh, I could have SHOPPED...but we were on a time crunch, seeing as all of the running stores were only open until 5:00 pm on Sunday, so we didn't stray. This is a big store, and it's kind of dark as you go toward the back. I found my handheld water bottle and I bet you can't guess the price. Oh, you can? Yep, $35. Our salesperson was nice, and we were super excited when we asked about the Brooks Levitate, because she said they had them! Or rather, they HAD them. Their first shipment had arrived and they had one pair of size 6 remaining - everything else had sold. 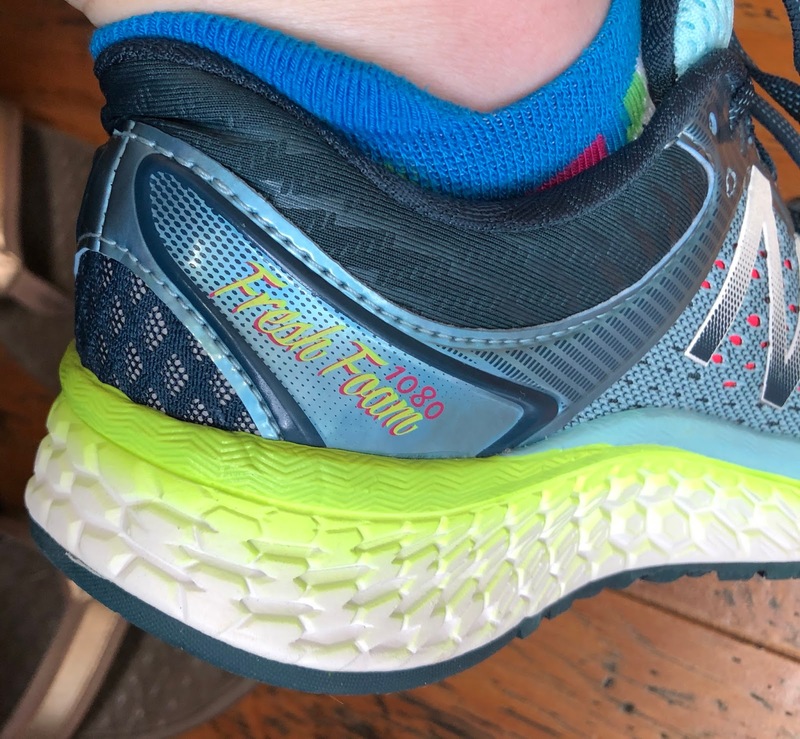 But we could at least see the display shoe, and I'm still intrigued enough to hold off on my next long-run-shoe purchase until I can test out the Levitates. They had a lot of shoes on display, but we'd tried on most of what our salesperson recommended for us already, and the store was warm - they had their front doors open and weren't using the A/C; a weak cool front had blown in that morning, but by the afternoon, it was in the 80s and that's just uncomfortably warm in a store. We didn't stay long. Our last destination was Fleet Feet in Round Rock, which was about 15 miles away from Texas Running Company. We made it to the area but Google maps led us to a dead end in a subdivision - what the what, Google?! Luckily it didn't take long to figure out how to get to our actual destination. Fleet Feet is located in a shopping center that also contains an HEB grocery store, so it was a busy parking lot on a Sunday afternoon. There were several salespeople helping customers when we walked in; we were greeted and told someone would be with us shortly, which was fine. We looked around at still more new-to-us merchandise - it really was fun to see so much running gear all in one day! I found my handheld water bottle, same price as all the other stores. Soon, a younger salesperson asked if he could help us. Diane told him she was looking for some shoes; he responded with "For what, walking? Or yoga?" YOU GUYS. I thought Diane was going to walk out right then and there. 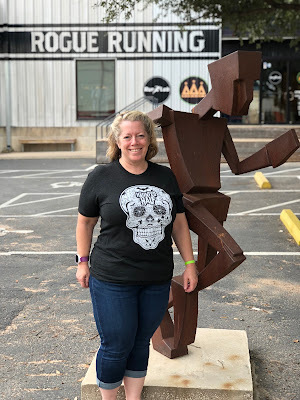 I mean, she was wearing her In Training shirt for Houston, I was wearing my new sugar skull shirt that clearly said "Halloween Half" on it (he didn't need to know we only ran the 5K that day) - his assumption was so upsetting to my marathon-running friend. I quickly said "for running" and he changed gears and went into normal mode of asking Diane what she liked and didn't like about her shoes, and he brought some options out. But dang. That was not a good start. Diane said she could see the other salesperson, who was still helping out a customer, cringe when this conversation was happening - my only hope is that they talked to him afterward about not judging customers based on what he thinks a runner looks like. Despite the rocky beginning, our salesperson was helpful in finding some different shoes for Diane to try on, and he noticed that she pronates on one foot (she does, she's had surgery on that foot) and suggested a stability shoe in the Hoka line - the Arahi, which she liked enough to buy and test out at home. He was the only salesperson to notice that, so props to him. Just...dude. It's much better to assume everyone is a marathon runner and let them tell you otherwise. I've always liked Fleet Feet stores - they are a locally-owned franchise, and I've had great luck shopping in them everywhere from California to North Carolina. I'm going to chalk this experience up to a one-off and go from there - in fact, I'd still return to this particular Fleet Feet to shop, if I'm in the area. Overall we had wonderful experiences at all of the running stores that we toured that day. I'm still on the hunt for the Brooks Levitate - yes, I can order them online, but I'd really like to try them on locally and not have to deal with shipping them back if I don't like them. Hopefully our local running store will get their shipment in soon. Oh - I did end up buying my handheld water bottle later - from Amazon, for $26 with free shipping. Still expensive, but at least it wasn't $35! Enjoyed reading your shoe and store reviews! At least you found your handheld water bottle cheaper online. I don't blame you that is a big price difference. I hope your local stores get the shoe you are looking for in there store soon. Thanks! And yeah, saving money on the water bottle helps to offset the cost of shoes. Now that's a shopping trip I'd like to be on. We have two running stores in what I consider decent distance, each about 20 minutes away from my house. So, I'm bad and mostly order shoes online. But, getting a good fitting is the EXACT reason to go local. I read somewhere recently you should get retested and refitted every 5 years because age and weight fluctuations can actually change the type of shoe you should be in. Again, I'm bad. I'm glad someone noticed Diane's pronation. That could totally be why she didn't like the other shoes she's been wearing. While I don't see anything wrong in sticking with a shoe you like, the problem is that the shoe manufacturers tweak and change each version, so sometimes you need to switch things up. And yes, getting fitted in person is the way to go - by more than one person would be ideal, just to see if they come up with similar shoes. LOL. The whole time I'm reading, I'm thinking, just get it on Amazon :) But I agree about trying the shoes on in person. Unless its a shoe I already have, I've learned my lesson about buying online. It sounds like you guys had a super fun day. Boy, that salesman. I hope he learned a lesson there. I'm all for ordering stuff online, but running shoes can be so different. It was great to get to try on so many! Sounds like a fun field trip. But boo to the salesman at Fleet Feet. Never judge a runner by the way they look. My sister wears Brooks and had many pair of the Ghost! They must be a pretty good shoe! Glad you found your water bottle. I wonder why they are so expensive? I was wondering that myself, about the cost of the water bottles, but maybe because people only buy them every three years or so? What a fun idea! I love how y’all spent your day! It was great to have a fellow runner to do this with. You can't always get away with that many stores with other people. WTF Fleet Feet guy. UGH. Can we stop labeling people as "runners" and "there's no way they could be a runner" based on - as you said - what we think a runner "should" look like? I wouldn't have responded politely. Also, who wears shoes for yoga??? Thanks for the tips on the other Fresh Foams (I just love that name so much, it reminds me of a peppy commercial) - I'll have to give them a try next time I'm in a running store. I do like to have decent shoes for my standing in the gift shop and walking expeditions. I can't believe that you have so many running shoe stores. I live in the capital of NYS and we have ONE - FleetFeet. I do go there to try on shoes and buy the first pair and then I order the rest online - cheaper. Wow, only one store?? That's rough, I know. I am exhausted reading about hitting up all those stores! LOL. One time John and I were eating out after a 40 mile ride in our biking gear. The server asked how far we biked and he said "*You* biked 40 miles?" WTF. We can thank the media for unrealistic looks for real athletes. Geez Louise to that server - what a jerk. What a fun adventure! Love the pics with the statue :) Don't love the judgy guy. He's lucky you guys are chill - I guess he needed the learning lesson. I hope your local store gets the shoes in you want to try!! !